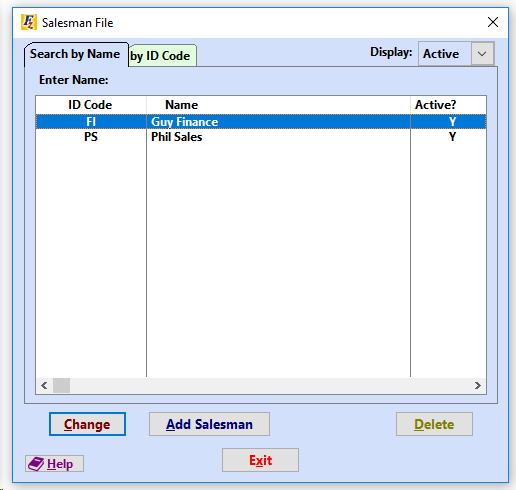 To complete the initial setup of the Salesman File, go to Sales >> 9 - Salesman File. Click to add a new sales person. 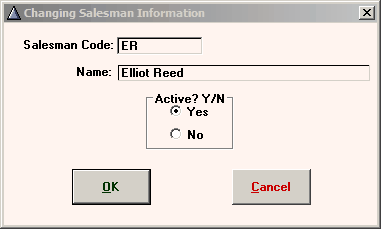 Click to edit an existing salesman file. To add a salesman to a sale click on "Add Salesman to Deal". 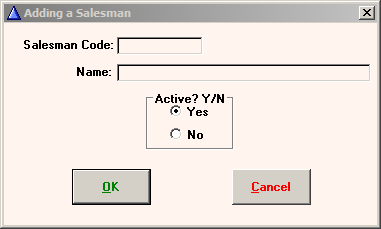 This button can be found when entering a sale by going to Enter Sales >> Costs tab OR after a sale has been completed by going to Customer Activity >> B) Customer Processing >> A) Customer Information and Costs >> Costs tab. To add a salesman to the list, click on "Add Salesman to Deal". Highlight the desired salesman and click on . Click "Add Salesman to Deal" again to add another salesman. 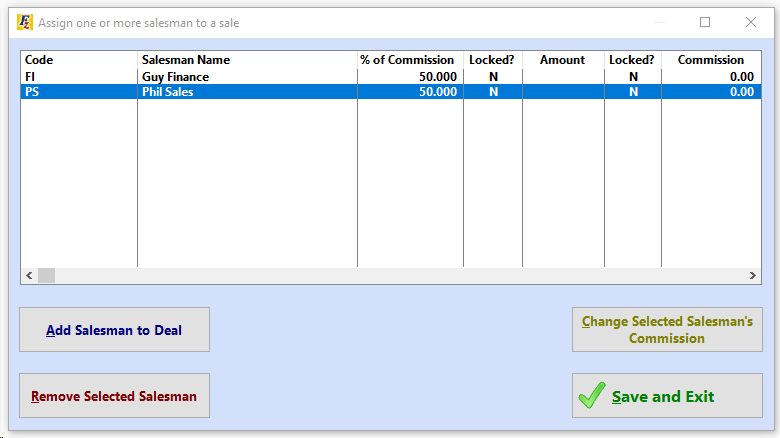 To review the salesman data for the sale, highlight the name of the salesman and click on "Change Selected Salesman's Commission". If only one salesman is assigned to the sale, then 100 percent of the commission will be assigned. Different percentages may be entered for multiple sales people, however, the amount will be locked in if the percentage entered does not total 100 percent under the "Percent" column. The initial sales person's percentage will also be adjusted to make a total of 100 percent under the "Percent" column. 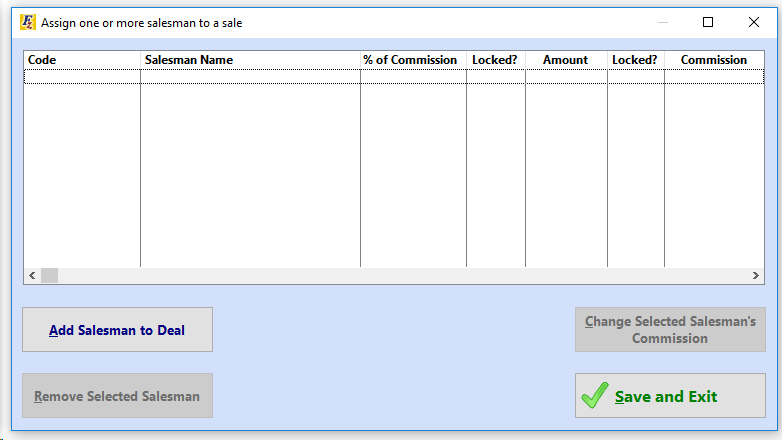 The actual commission amounts will NOT generate until the button has been selected for the specific sale and the manner of calculating the commission is selected. 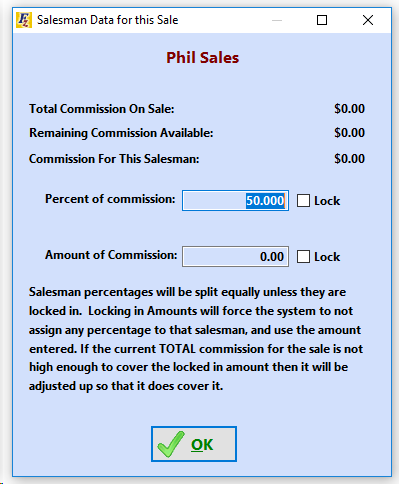 See Calculating Commissions for a Single Sale. A commission amount may be entered instead as a flat amount. The amount is automatically locked in as soon as the amount is entered and the box checked. The commission amount will override any calculated commissions. 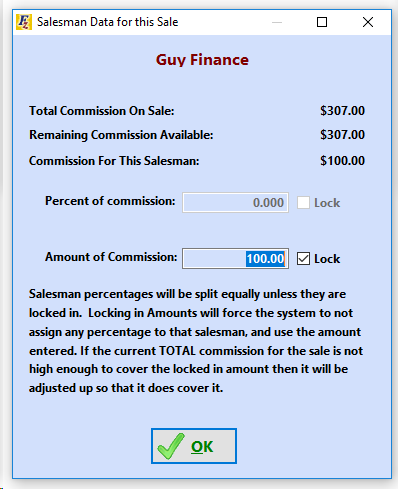 Go to Calculating Commissions for a Group of Sales or Calculating Commissions for a Single Sale for additional information.